October 2018 saw the 4th module of our first cycle take place just outside Naples. This was a milestone as we had the thrill of seeing our first young evangelists graduate. Praise God! Together we explored the relationship between the evangelist and the church, what it means to be part of the body and called, in part, to equip the Saints for service. It was also encouraging to welcome two new participants who now start the FEE journey over these next two years. May God use this training as a tool to bring Gospel impact across Italy! 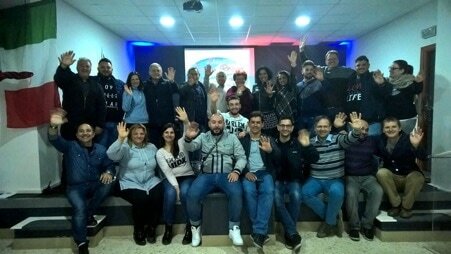 April 2018 saw Module 3 of FEE - the formation of emerging evangelists in Italy. We thank God for steadily increasing numbers and growing testimonies as to how the training is making a difference. With evangelists from several different cities, there is something special and important about facilitating the connection of these young evangelists. Plans are now afoot for a joint evangelistic mission in September, where the evangelists in training will have opportunity to be engaged in evangelism, preaching and teaching together. We look forward to seeing how the Lord will use that time to change lives and as a catalyst for further growth in the FEE participants. The second training module, 'The Evangelist and Context', took place at the beginning of October. There was a tangible sense by the end of our time together that this new FEE venture is starting to gain traction. We had an encouraging and inspiring weekend, as together we pressed into the Lord with a desire to be more effective in our calling. It was particularly challenging, and exciting, to hear testimony from one of the participants; after the very first training back in April, he determined to make a list of all his work colleagues (circa 130) and to systematically share the gospel with each one! He has had numerous 'God encounters' and is now talking with his boss about holding a service once a month in the workplace. Praise God! After nearly two years of planning, we were delighted to see training for young evangelists launched in Italy. Based in Naples for this first residential weekend, participants gathered from at least three different cities and we spent the weekend exploring 'The Call of the Evangelist'. One evangelist told of how it seemed she would not make it. There were so many barriers blocking her way and then a miracle happened. God spoke to her powerfully during our time together. Some of the young men present are preaching Jesus in a difficult context. I know they value our prayers. Please pray too for the Italian leadership team as we take this training forward in the coming months and years. Thank you!